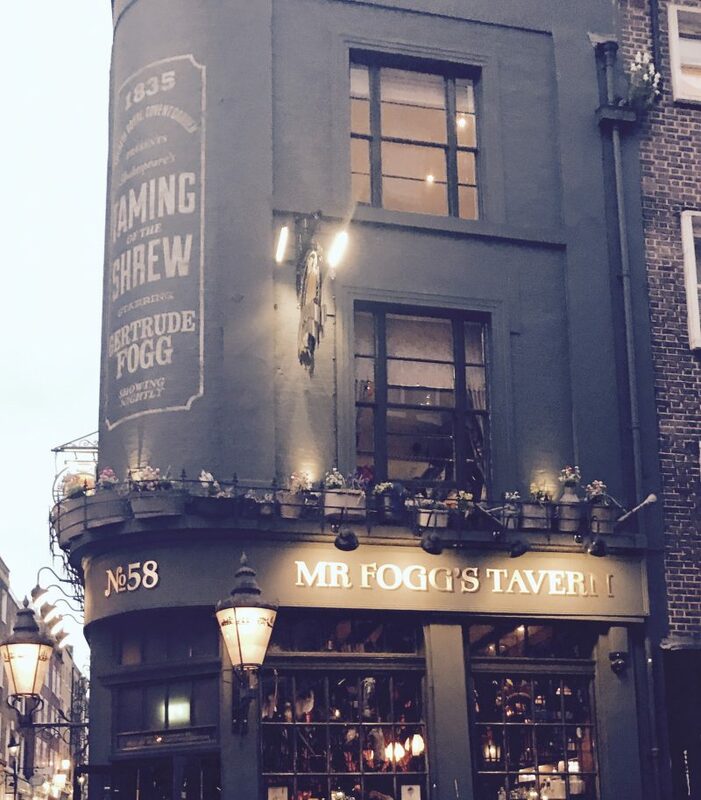 Ladies and Gentleman, if you are around Covent Garden or Mayfair please take the time to visit Mr Fogg’s Residence, Tavern or Gin Parlour, I have no doubt you will enjoy the experience. A group of us were out in London for the weekend and we had a drink in the Tavern and am I glad we dropped by. The Tavern, for the eccentric British adventurer as they say, well, yes it is rather eccentric and out of the ordinary but you know what, I really quite liked it. As soon as you enter you are greeted immediately by the buntings with the British flag hanging from the ceiling, along with bird in birdcages, prams, dolls, kegs and all sorts of quirky treats for the eye. I honestly could not keep looking around. Our ears could hear the clanging of beer glasses, music and laughter, the bar staff in character with 1800’s theme. They were suited and booted in attire fit for theatre and they did put on a good show for sure. The Tavern has a bar situated immediately as you enter. I ordered a beer which of course I didn’t manage to drink it all as I had been drinking Prosecco and wine throughout the day but for those that can handle a drink Mr Fogg’s Tavern offer Liquors, champagne, beers, and shots of all sorts. We had a bitter orange shot. Yes, it was tasty not like those shots where you end shake your head and making a yuk sound its actually not bad at all. At the Tavern, you can order food from the Bill of fare menu, unfortunately we had already eaten but will try and make a point of returning to try the food. As you may know from some of my other posts I have to mention the toilets of the places I visit, maybe if I’m not in the mood I just go to the loo like normal people and don’t pay attention to the details but these were to good not to mention. I walked down the wooden staircase, the picture frame with a corset and an arrow told me I was heading to the right place. The walls lined with wallpaper with peacock’s printed on it and opposite to the staircase was a door called “Scullery” I was impressed by this small touch obviously that door was for staff. I spotted at the bottom of the stairs a cabinet with a globe and china plates nicely mounted on the shelves with beer barrels close by. I could have been a scullery maid for just one second. The ladies were to the right of the staircase and I wasn’t disappointed. As I entered I could hear voices so I assumed there were women in the loo’s when in actual fact I was listening to the part from the film “My Fair Lady” coming from the speakers. You know, where she says, “The rain in Spain, falls mainly on the plain. I was at that point desperate, you know all that drink goes right through you, so I hurried to the cubicle, decided to have a look around after, however, I love this film so had to make reference to it and I did smile to myself. I was so impressed with the ladies I must admit. 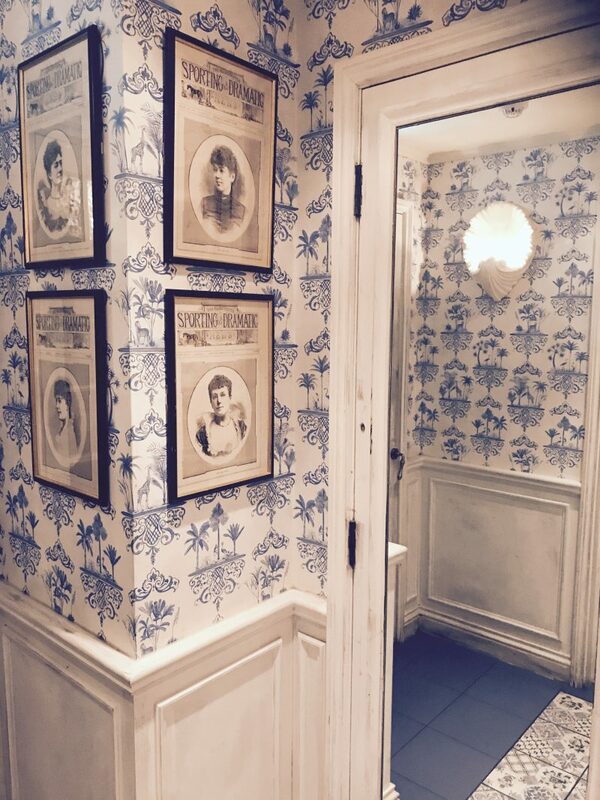 There was wallpaper, framed mirrors, copper piping, ceramic tiling on the floor, prints with newspaper articles of women from that era. It may not sound much but I really like it. In fact, I literally loved it. 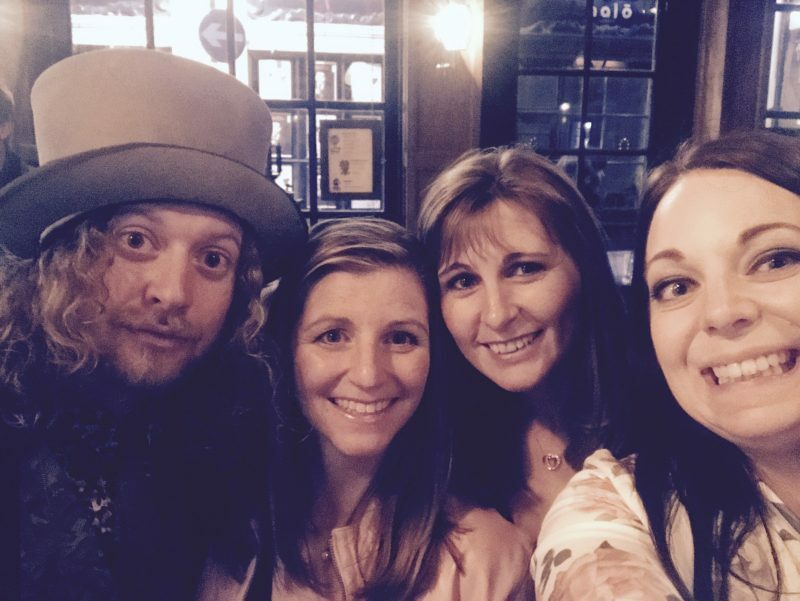 In all honesty the visit to Mr Foggs was very short but the time we were there we interacted with the staff and they were getting into the spirit ringing a bell they had on the counter and joining in with our celebrations and giggles. A great atmosphere which actually is hard to achieve in some places and we managed to get a selfie with one of the busy staff members. Please go to visit, you will have a fab time and they even have on Thursday’s a good ole Cockney sing along. Try something different, you won’t be disappointed. 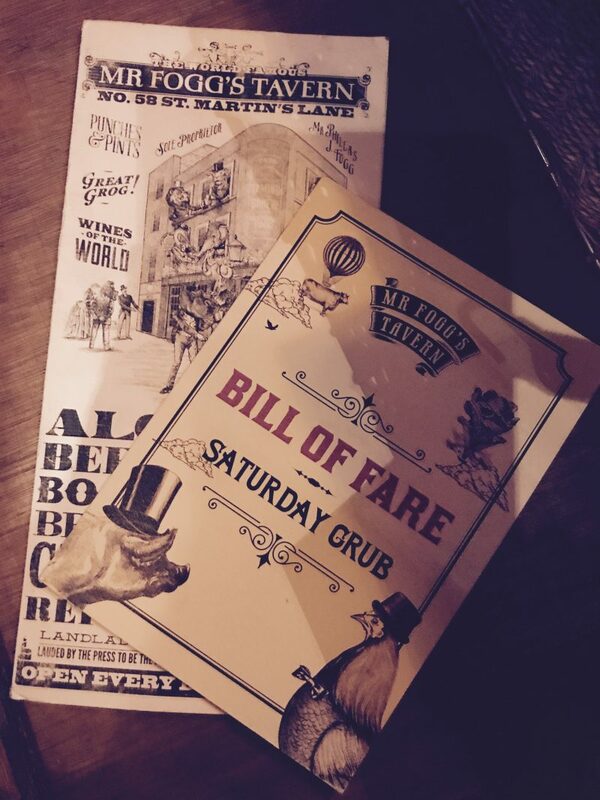 Thank you for taking the time to read this post and I hope you enjoy your visit to Mr Fogg’s.